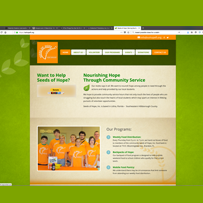 Seeds of Hope - Collective IT Solutions, Inc. This website was designed by another firm with a popular WordPress template. Collective IT Solutions, Inc. was able to take over this site and give the client exactly what they were looking for in a quick and professional manner. An event management system and payment gateway were set up and utilized. New design applied per clients needs.